[Convection]: Movement within a fluid caused by the differences between two areas that result in a transfer to reach equilibrium. The final project focuses on Carnegie Mellon University's Hunt Library and how we can design a parasite that can improve aspects of the current library condition. My design for an insertion to the Hunt Library focuses on circulation of not only the occupants, but also the books, within the same space. I've also rearranged the program such that all the bookshelves would be grouped and moved to the top two floors to open the floor spaces below for occupants. I envisioned the use of technology, such as a conveyor belt and robots to transfer books vertically within the library. As my parasite is mostly made up of glass, it allows for natural light to enter the library and for artificial light to enter the circulation area, especially at night. The two circulation paths are made up of two circles from plan view that are offset slightly. Locating the book collection table that joins the parasite with the existing library and depicting experiential perspectives of a person within the circulation area. As movement is very important to my design, the different in speed of the humans and the books are displayed in blue and red dots respectively. 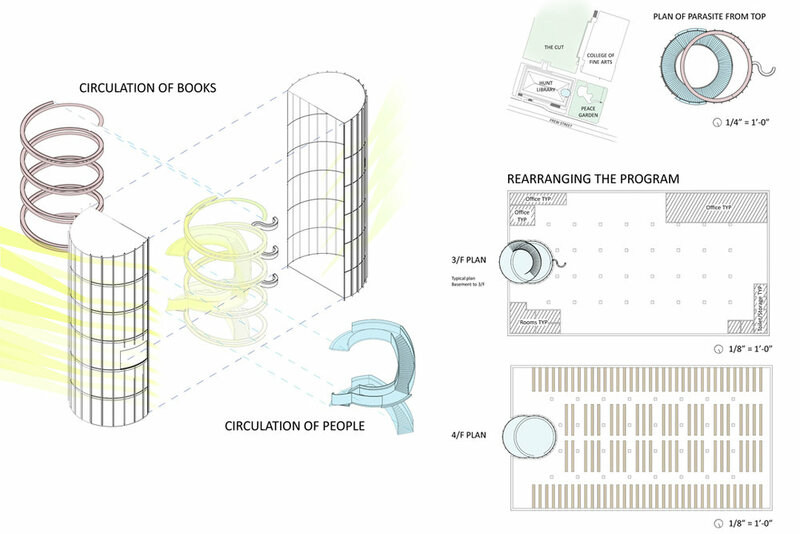 The diagrams show the essential changes to the library with the insertion of my design.